Buffalo, NY (October 8, 2018) – According to the Buffalo Police Department, at least one person has suffered injuries after a truck crashed and overturned onto its side on Sunday night, October, 7. 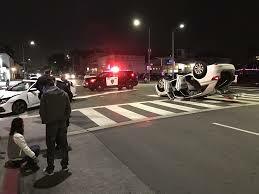 The accident occurred on Elmwood Avenue near Summer Street at approximately 7:15 p.m.
Police stated that the truck had been heading south on Elmwood Avenue when it flipped over after it struck a parked car. Emergency medical personnel were quickly on the scene to help any injured victims of which at least one is known at this time. The 30-year-old driver of the truck, identified only as a man from Eden, was transported to Erie County Medical Center. That victim is currently listed in serious condition. It is unknown at this time whether or not there were any other parties involved in the crash or if anyone else was injured. Police currently have reason to believe that a medical condition or possibly a mechanical failure may be to blame for the accident. No further details have been released at this time and authorities are currently investigating the events that led to the crash. We would like to extend our sincere sympathies to the known victim of this accident as we certainly hope for his full recovery. While so many car accidents in New York are due to the negligence of a driver, often a negligent manufacturer or other entity is just as liable. People often have adverse effects due to a medication they have been prescribed, which can lead to a serious accident. Of course, this is only one example, as things such as poor mechanics often lead to motor vehicle accidents that are not the fault of any drivers involved. At Hach & Rose, our empathetic and compassionate New York accident attorneys are devoted to recovering compensation from negligent drivers and other entities. If you have been hurt in a car accident that was not your fault, call 212-770-0057 and let us put our knowledge to work for you.